Who Does Almond Milk Coffee in Brisbane? Alright milk, it's been fun. We've had a few laughs and thankfully no one lost an eye, but are we really just going to settle for regular dairy milk the rest of our lives? We want to play the field! See what's out there. We're not getting any younger and that sinus problem isn't going to clear itself. Daisy's been put out to pasture and I think it's time we assessed our other milk options so we won't be forced to take our coffee black. 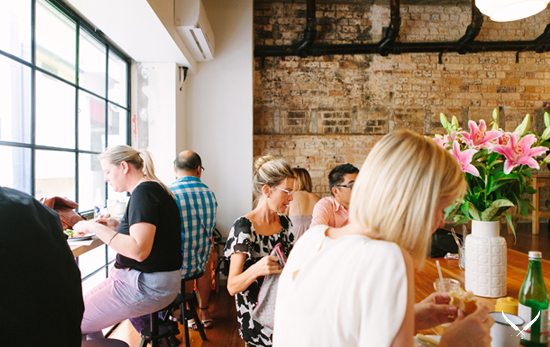 Almond milk is a fresh dairy alternative, but it's not easy to find in Brisbane's cafes. Straddling the dual disciplines of Acai and espresso, Kiss the Berry are proving themselves to be masters of both. Using locally roasted beans and ethically sourced ingredients, their almond milk coffees marry their two specialties beautifully. Paleo cave, Symposium, will whip you up a frothy brew made on almond milk, no questions asked. Hot tip for the lactose averse, they also do Zymil coffees. Who is surprised when Brisbane's favourite superfood bar spruces unconventional milk? Known for their acai bowls, Coco Bliss offers an almond milk substitute not just in their coffee but also their smoothies, frappes, and protein shakes. Load it up with fruit, veggies, and coconut water and swan about like the pious mofo you are. If cavemen had access to Primal Pantry's almond milk coffee, there's a good chance we might have never evolved. These guys are professional convention-dodgers so hit them up for an almond latte. You're in safe hands. With a focus on fresh, locally sourced produce, it's not a huge suprise CBD cafe Felix will make you an awesome coffee on almond milk. You didn't think all the entries on this list were going to be completely saintly, did you? Pick up an almond milk brew at the Bread and Meat Co. the next time you get a monster jonesing for one of their slammin' sangas. Avoid the afternoon lull with one of Mondo's almond milk coffees after your next organic power lunch. These folks never disappoint so make sure Mondo Organic's your first stop if you're an almond milk virgin. Recharge dem batteries amid your weekly grocery haul at any one of Wray Organic's in-store cafes. They do a mean coffee on almond milk and offer a delicious and nourishing array of nutty sweets to complement the almonds perfectly. A cafe nook literally ensconced in sportswear, did the folk at Lorna Jane really have a choice? Stock up on new active threads, power up with an almond milk coffee, then sneak in a slice of raw carrot cake. Where do you get your almond milk coffee in Brisbane? Let us know in the comments below!